Everyone enjoys a good road trip, right? The cool air running through your fingertips as they dangle outside the window. Friendly faces, warm exchanges, and thoughts shared among small talk. The world passes you by. Now, take that nice, positive reflection and shatter it to a million pieces. 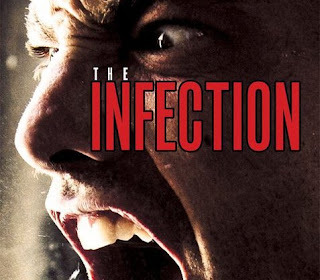 “The Infection” knows no limits. Craig DiLouie takes you into the dark side of your subconscious. His words pull you into a place where no light will guide you to safety. This is a road trip through hell. Pittsburgh – as with the rest of the world – is under siege by a virus unlike any other. You’re trapped, with nowhere to run. No place to hide. Instead of a car, you’re crammed into a claustrophobic armored personal carrier. No windows with a nice, gentle breeze; replaced by the hot acidic smell of harsh diesel fuel and gunpowder. You are among people who have been forced to understand the need for survival. The need for each other has never been stronger. This is the first book in a series of survival among the ashes of a decaying social system. The writing style is very easy on the eyes. The curves of the words make twenty pages seem like five. I recommend this book to anyone who has a hunger for something a little different when looking for something to rip your mind into. After reading this book, do yourself a favor and go for a nice, long walk. Be thankful that Mr. DiLouie has been able to make a readable nightmare you can stroll through. For the latest news and updates on the author’s literature, take a jump over to his website. The book is also for sale for an incredible price at Amazon, with a Kindle version also available. Stay tuned for a review of the second book - by yours truly - in about a week or so!